A little over a year ago my brother, Jack, phoned and said that he and my dad were coming to Charleston for a visit. This afternoon, my brother, Jack phoned to say that about 1:30 am EDT, our dad left for a permanent visit with our Father. He would have been 90 on Sunday 6 August, 2006. My brothers, Bill and Jack had planned a birthday party. Ellen and I visited with him in late May - just after moving to Singapore and were looking forward to seeing him when I returned to Duke on 25 August. Now its too late. He gave us many gifts and I shall miss him very very much. He always maintained that he never met anyone that he could not learn from. All of us have used this lesson through our lives and passed it to our kids. The second lesson was about helping. "A good helper" my dad said, "always knows what the boss needs before the boss knows what he needs". This taught us a lot about thinking, being actively engaged in whatever we were doing and anticipation. Below is what I wrote when he visited us March, 5, 2005. My dad transferred many gifts to me. But perhaps the greatest gift was that of endless curiosity. 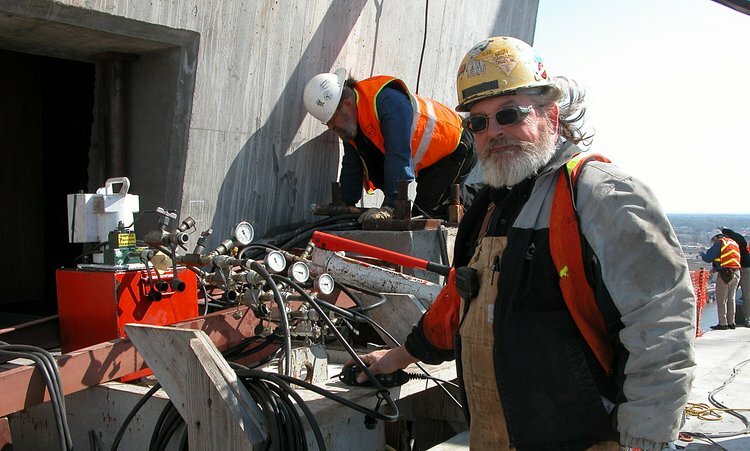 When I was a kid - we used to travel to different construction sites where he was installing elevators. Sometimes on the weekends, we would visit a sick elevator and repair it. Sometimes we simply walked from our home in Greensboro to the railroad switch house. We would sit for hours watching the trains pass. We would count the cars. Sometimes, we would enter the switch house and if we were good and very very lucky we got to throw swiches which changed the communication between parallel tracks. All the time, he displayed not only curiosity but an enquiring mind. Yesterday my brother, Jack, phoned from Burlington, N.C. He had just driven to my dad's place from Pennsylvania and announced, "can we visit"? Of course, and so about 7pm last night they appeared. My dad is 88 and still just as curious as ever. 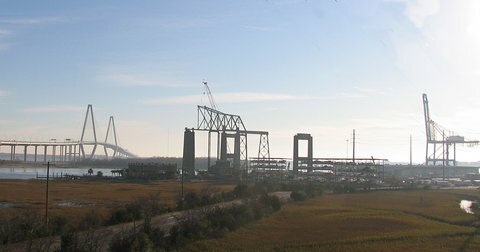 I knew of his love of construction and thought of the possibility to drive to various places and view the new Cooper River Bridge. The perfect opportunity for an unplan-plan. Every time I said "Cooper River Bridge" he told a story about elevators he installed at Santee Cooper - probably 50 years ago (I don't really know). I phoned Peo Halvarsson (Main Span supervisor from Skanska and PBC) and asked if we could visit. He agreed and provided Jack and my dad with a vest and hard hat. This morning, we started our tour. We saw the bridge from many perspectives. All the time he was telling stories and looking and asking questions: a 16 year old curiosity hard at work. Dad just stood in amazement. He walked here and walked there. Looked at everything. It was probably the best way to return a small portion of what he gave me. I even took a few photos. Digital photography@work. 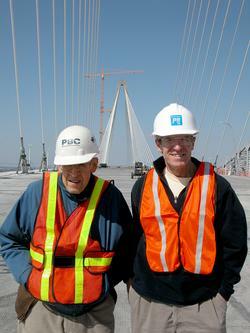 When we were on the Ravenel Bridge site together, Peo was organizing the installation of the bearings and I met Wilbur Poole for the first time. Below is Wilbur and in the background to the right, is my dad's back as he is looking down over the Pearman bridge. What a wonderful day we had!